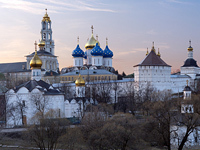 Sergiev Posad, a small town located 75 km northeast of Moscow, was grown around the Holy Trinity Monastery that was founded by monk Sergiy in the 15th century and very soon became a spiritual center of the newly united country. Nowadays the Holy Trinity St. Sergiy Lavra is a big orthodox center which fortified walls enclose an active monastery, a unique architectual complex, and a Theological Academy of the Russian Orthodox Church. Believers from all over Russia come here to pray to the holy relics of St. Sergiy kept in a sarcophagus in the Holy Trinity Church, while non-believers approach here to enjoy peaceful atmosphere of the place and still to feel closer to sources of Russian spirituality. To look at photos of Sergiev Posad. Opening Hours: daily 9.00 am-5.00 pm. Abramtsevo came from obscurity at the beginning of the 19th century when a neglected estate, 80 km from Moscow, was purchased by writer S. Aksakov. In 1870 the property came to the hands of Savva Mamontov, a wealthy industrialist and patron of the arts. Being inspired with idea to recreate a pure Russian art style, Mamontov welcomed best Russian artists to the estate. In the 1870s and 1880s Abramtsevo became a kind of artistic colony whose frequent guests were painters Serov, Korovin, Nesterov, Vasnetsov, Repin, Vrubel, theatre director Stanislavsky and bass singer Shalyapin, composers Rachmaninov and Rimsky-Korsakov. Today in Abramtsevo there are not many original exhibits related to these celebrated names, still it remains a good sample of traditional Russian estate set in beautiful natural surroundings. Abramtsevo lies about 6 km south of Sergiev Posad and can be conveniently visited along with Sergiev Posad. 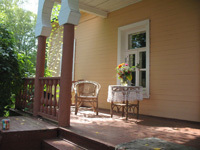 To look at photos of Abramtsevo. Opening Hours: Wednesday - Sunday except the last Thursday of every month, 10.00 am-4.30 pm in summer, 10.00 am-3.30 pm in winter. Peredelkino is a dacha settlement, situated 5 km southwest of Moscow, nestling in pine groves. In 1934 Maxim Gorky suggested handing over the area to the Union of Soviet Writers, and quite soon it was turned into Soviet authors' colony. Among Peredelkino' settlers were Pasternak, Tarkovsky, Tchukovsky, Ehrenburg, Babel, Zabolotsky, Rozhdestvensky. In the 1990s three dachas were opened as museums, and all three is a priceless gift to all interested in Russian culture, for interiors and settings of the houses remained almost untouched after death of the hosts, unless some exhibits have been added later on. These are houses-museums of Nobel Prize winner Boris Pasternak, children writer and literary critic Korney Tchukovsky, and poet Bulat Okudzhava. In Peredelkino there is also a cemetery where many writers are buried in the shade of the old Transfiguration Church. To look at photos of Peredelkino. 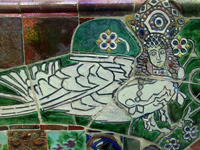 Opening Hours of the House-Museum of B.Pasternak: Thursday - Sunday, 10.00 am-4.00 pm. Opening Hours of the House-Museum of K.Tchukovsky: Thursday - Monday, 10.00 am-5.00 pm (by preliminary request only). Opening Hours of the House-Museum of B.Okudzhava: Thursday - Sunday, 11.00 am-4.00 pm (by preliminary request only). There is no lack of former noblemen's estates scattered around the Moscow countryside, but Arkhangelskoye, just to the north-west of the city, seems to be the gem of the collection. First it belonged to the Golitsins who built a manor house and laid out Italianate gardens in front of it. In 1810 the estate was bought by Prince Nikolay Yusupov, a brilliant statesman of Catherine the Great's epoch. His art collection which aroused envy of European monarchs was set in forty artfully designed halls of the Arkhangelskoye palace, and a plenty of marble copies of classical statues was disposed around the park. At present the palace is closed for reconstruction, only three freshly renovated halls are shown to public during weekend tours in summer time (advance booking is required). 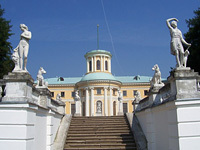 Besides the park, visitors can see the Yusupovs' pantheon, some lesser premises, and a display of the porcelain produced in the Yusupovs estate's factory. In summer Arkhangelskoye hosts live classical music concerts. Opening Hours of the Park: Wednesday - Sunday 10.00 am-8.00 pm, except last Wednesday of every month. Opening Hours of exhibitions: Wednesday - Sunday 10.30 am-5.00 pm. In 1909 the old estate Gorki, surrounded by relict forest, came under ownership of Zinaida Morozova, widow of prominent bourgeois Savva Morozov. Having just become a noblewoman after marriage to Moscow governor Reinbot, Zinaida put the whole soul and all capital into her "noble nest". The mansion was remodeled in the fashionable Neoclassical style by renowned architect Fyodor Schechtel, and saturated with objects of art. 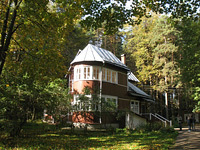 In 1918 Gorki was nationalised by Bolsheviks, to become a home for Vladimir Lenin who lived there until his death in 1924. 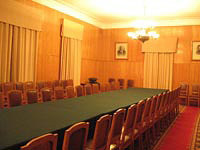 Visitors of the estate may examine the mansion inherited by Lenin from Morozova, the garage with Lenin's Rolls-Royce remodeled into a winter car, and a reconstruction of Lenin's quarters in the Kremlin. To look at photos of Lenin's Gorki. Opening Hours: Wednesday - Monday 10.00 am-5.00 pm, except last Monday of every month. Anton Chekhov, one of the most staged playwright of our days, bought Melikhovo in 1892 and lived there until 1899. This small but cosy estate, located 80 km south of Moscow, was a fulfilment of the writer's dream about living in countryside, gardening and writing in peace and silence. Chekhov really enjoyed his country life in Melikhovo and wrote there over forty works including "The Seagull" play. Only rapidly progressing tuberculosis forced him to leave Melikhovo for Crimean Yalta. 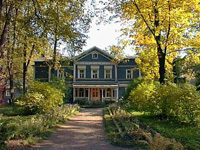 In the museum-reserve visitors can see a house where Chekhov lived with his ageing parents and sister Mariya, a nice garden with a plant-filled pond, and a village school initiated by the writer. In Melikhovo you have a great chance to feel a human-loving nature of the person who once said "Medicine is my lawful wife, and literature is my mistress". To look at photos of Melikhovo. Opening Hours: Tuesday - Sunday 10.00 am-5.00 pm, except last Friday of every month. Klin, 90 km northwest of Moscow, is mostly famous for the House-Museum of composer Peter Tchaikovsky who spent in Klin last years of his life. Almost all his life the composer had to move from one place to another, and it was only in Klin where he first felt himself at home and wrote in his diary: "I can't imagine myself living anywhere else. I find no words to express how much I feel the charm of the Russian countryside, the Russian landscape and the quiet that I need more than anything else." In Klin Tchaikovsky wrote ballets The Nutcracker and The Sleeping Beauty, operas Iolanta and The Enchantress, majectic Fifth and Sixth Symphonies. Only special guests such as winners of the International Tchaikovsky Competition have the honour to play the composer's grand piano in the sitting room. Opening Hours: Friday - Tuesday 10.00 am-6.00 pm, except last Monday of every month. Star City or Zvezdny, 25 km east of Moscow, only recently was a highly restricted military facility, totally closed for public. It was established in late 1950s, and it was here that all Russian cosmonauts have been trained and where they lived. In the local Space Museum visitors can see the unique exhibits including the real descent capsules of the Vostok spacecraft and the Soyuz-4 spacecraft, real space suits in which cosmonauts worked in space. 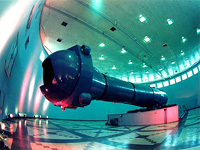 At the Yuri Gagarin Cosmonaut Training Center they are able to see training facilities that even today are being used by both Russian and international astronauts, such as a centrifuge, the simulator of the Soyuz TMA spacecraft used for training to act in extraordinary situations, the Neutral Buoyancy Laboratory for training to work in outer space. Preliminary booking of the Space Museum Tour and the Simulator Tour is required. 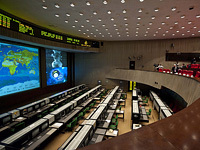 Russian Mission Control Center (TSUP), analogue of the American Mission Control Center at NASA's Johnson Space Center in Houston, is located 8 km north of Moscow at Korolev town called so after the Soviet spacecraft chief designer Sergey Korolev. All Russian space vehicles including spacecrafts, stations, space ships and satellites are operated from the Center. At the Center visitors are taken into the Flight Control Room of the Mir Space Station to be shown how the Mir was operated, and into the Flight Control Room of the International Space Station where experts tell them about joint management of the ISS together with the NASA and other members of the project. On the screens guests can observe the moving of ISS. There is also a chance to be present at a communication session with the crew of ISS. At the museum of the Rocket and Space Corporation Energia visitors may touch the descent module flown by the world's first cosmonaut, Yuri Gagarin, see with their own eyes the Voskhod-2 multi-man spacecraft, from which Alexei Leonov pioneered in performing space walk; full-scale mockup of the Soyuz-Apollo and many other things. Visit to the Center and to the museum must be arranged in much advance.